The very rare alba form of this waxy flowered species – and the most vigorous alba forms we have seen ! This population is the result of a selfing, and we have hand-picked only 6 of the biggest plants (leaf spans are approximately 25cm) producing the broadest leaves for a very limited first release. Greenish-yellow flowers are lightly marked with narrow light brown hieroglyphs leading to a central white heart. 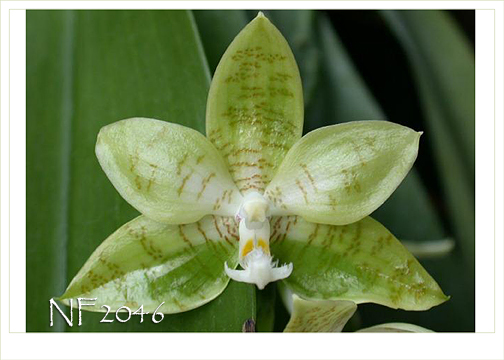 A must for every collector of the more rare color forms of Phal. species ! Extremely limited and Very Highly Recommended !